I can ping it on the network and I can SSH into it. 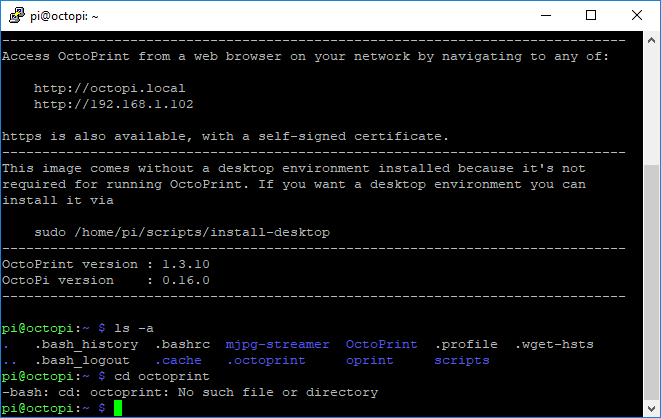 I followed the 'Getting started with OctoPrint on the Raspberry Pi 1, 2 and 3!' video on you tube and expanded the filesystem to use the whole SD card. Basically I got up to 7mins31secs in the video. 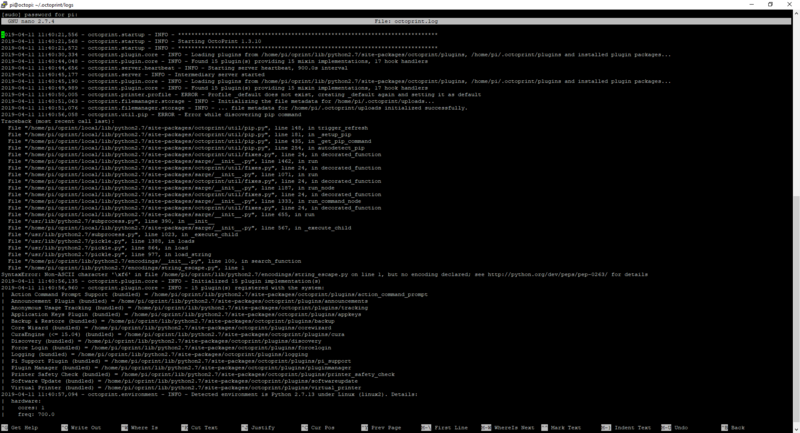 I can't see the log file because the OctoPrint directory doesn't exist even though it lists it with DIR command. how can the directory appear in the DIR command but the CD command doesn't let me navigate to it (it does let me navigate to the other directories in the same root? octoprint is a hidden folder. Try ls -a instead of DIR. Hidden folders and files start with a . Thanks for the quick reply. Yep I can see more directories now, the OctoPrint directory (along with the others I could see before) is blue but i still can't navigate to it because it says it doesn't exist so i still can't get to the log file. The name is .octoprint, not octoprint. Try cd .octoprint. Can you send the entire log file? The details may be hidden lower down and we can't see. 2019-04-11 11:40:51,076 - octoprint.filemanager.storage - INFO - ... file metadata for /home/pi/.octoprint/uploads initialized successfully. 2019-04-11 11:57:59,277 - octoprint.server - INFO - Goodbye! Oh noes. Why is is listening on the internal ip address? Did you skip a step? Are you using the wifi interface or ethernet? That's normal on OctoPi since that comes with a reverse proxy in front. This however is not normal. Is that a fresh install? That's very unusual. This even more so. Where did you get that image? Either it's not an official OctoPi release, or the flash has become corrupted or the SD card is broken. Well, the server is indeed not running, it was shut down gracefully. Why isn't visible from the log though, thoug with the odd other entries and especially that nonsensical OctoPi version I'd say - download a fresh image and reflash. It comes with a reverse proxy? Is that on by default? Then share a new log please. There are times when Notepad++ accidentally replaces the first character of a file with that character if the encoding is incorrectly set, for what it's worth. Although Notepad++ probably wasn't involved, it could be a similar problem if the encoding isn't correct. Technically, I think the ö is this character if seen by itself. Sorry for the distraction, but the original problem seemed interesting to me.